This course is been organised together with Manchester Medsoc, however you do not need to be studying at Manchester to attend. Quite unlike any other revision course, Clinical Cases is crafted from 25 patient scenarios that integrate together the entire MBBS/MBChB medical and surgical curriculum. In addition to the 200-page colour textbook, for a full 6 months you can re-watch all the lectures and consolidate your learning with 500 Single Best Answer questions & 100 ECG questions online. 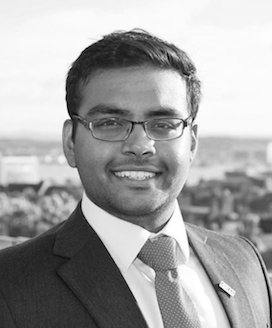 Sivesh is an Academic Foundation Trainee at Newcastle University Trust Hospitals (NUTH) with interests in Academic General Surgery. He is currently steering committee member for the Student Audit and Research in Surgery (STARSurg) National Collaborative and the International, multicentre prospective cohort study, Oesophagogastric Anastomosis Audit (OGAA). He has published over twenty PubMed articles and delivered at over at over fifty national and international meetings. In 2018 he was awarded an "Excellence in Research Award in Hepatobilliary and Pancreas" by the American College of Surgeons. The teaching was interactive and clear. The quality of the handout is excellent. Additionally, the summary of each case and the 'exam tips' are brilliant prep for MCQs. I really enjoyed the weekend.